My son likes Fireman Sam. This means I see Fireman Sam. A lot. Other than wondering why Sam hasn't actually murdered Norman Price and buried him in a shallow grave on Pontypandy Mountain, the show generally just washes over me. Today, I spotted the character, Elvis Cridlington playing what seems to be some sort of prototype Blue Collar. How he can have gotten his hands on this is a mystery. Perhaps he rescued it from a burning warehouse and secreted it in the back of the fire engine. A while ago, when I decided my older logo needed an update, this logo on the right was included in a long list of thrown-about, first-attempts. For fairly obvious reasons (that swoosh is much too Fendery), it wasn't a long-lived option and it never saw the light of day but, somehow, Elvis has gotten hold of it. How far up the ladder does this thing go? Sam, himself? Station Officer Steele? 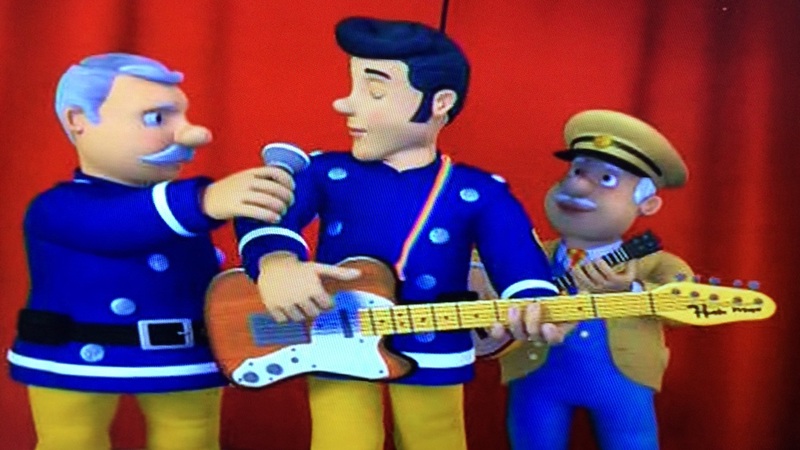 Pontypandy is a hotbed of corruption and (bloody awful) guitar-playing.